It all started with a simple blackhead extraction video—that's when her popularity began to explode, right on film. Sandra Lee, M.D., better known as Dr. Pimple Popper, can often be seen in shared Facebook articles and Instagram tags. 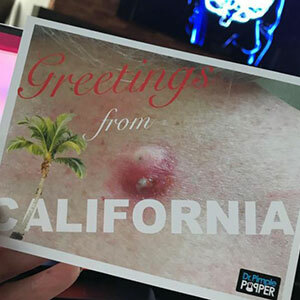 The dermatologist began filming patients’ blackhead extractions, cyst removals and other dermatologic needs to post on social media in 2014 after a decade in practice at Skin Physicians & Surgeons in Upland, CA. Her videos skyrocketed into a business that other estheticians and dermatologists are now beginning to pop into—including a product line and other media ventures. In an exclusive interview, Lee shared how her career in “pimple popping” took off, how the esthetic and digital worlds fit together and what is next. Skin Inc.: What motivated you when you started filming patients and procedures? Sandra Lee (SL): I opened an Instagram account because I knew that dermatology is a very visual field. … I love my patients, and I thought to show a little window into my world would be nice. I noticed early on that a blackhead extraction I published got a noticeable uptick in likes. I had a YouTube channel already, mainly for my TV appearances. … I was astounded to see that there was a subculture of people who shared these on the internet. Initially [my channel] was based on popping, which is what drew the interest. But it's so much more than that now—it's showcasing dermatology and what an amazing specialty it is, and really showing people what we do on that end. From the other side though, you see a lot of other people in the spa and medical industry who have their own Instagram channels now. I believe I was one of the first to do that. People in the industry were seeing that [social media] is an excellent and inexpensive way to market yourself. SI: How does your position as a social media influencer help to educate consumers and other estheticians and dermatologists? SL: You become very influential. … It is pretty much on a daily basis that somebody comes from out of town, state and even out of the country to come see us. If you decide you want to get a facial, how do you decide right now? You probably go on Yelp, or on Google as well as you may ask your friends. [The videos] give you the opportunity to see who that person is, their personality, how they work, how they interact with their patients and their clients and what their office is like—and it goes both ways. "[The videos] give you the opportunity to see who that person is, their personality, how they work, how they interact with their patients and their clients and what their office is like—and it goes both ways." You have to be able to showcase yourself well, obviously, and it teaches us to be good providers. 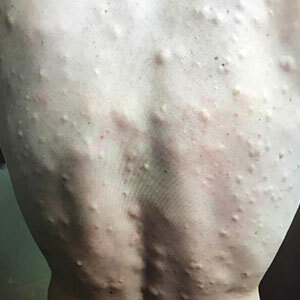 It really is something that can influence people to choose you versus somebody else—I mean, why in the world is somebody traveling from Canada, from Saudi Arabia, from Africa, for me to remove their cyst or pop their pimple? That's a big deal for them to travel that distance, and it's because of the trust they have and that they already feel like they know you. SI: What do you hope clients and other doctors take away from your videos? SL: What I hope is that they realize what a fantastic specialty dermatology is. I feel I've sort of tricked them—in a positive way—into educating them. Now so many more people know what a cyst is versus lipoma, versus a blackhead, versus a milia, and how to take care of their skin more. I'm trying to give people skin care advice. The things that other spas or doctors can learn is how to potentially do this themselves. It does take a little bit of effort, but it's as simple as using an iPhone and carrying it around with you and taking photos—these are all pretty much just filmed completely with my smart phone. What's so interesting is that I cannot watch other people's videos. It's not because I think a lot of myself I can't watch anyone but mine, that's not it. It's actually that when I'm doing it, I feel like it's a beautiful thing. SI: Is it a personal experience then? I do it mainly because it gives me satisfaction and happiness, because I know I'm getting rid of something that my patient has been wanting to get rid of, and nobody was helping them with it. I also know [certain procedures] are something that some people are just going to love so much and watch over and over again, and use it to help them fall asleep at night, like their bedtime story. "I think that I've sort of tricked [viewers]—in a positive way—into educating them. ... I'm trying to give people skin care advice." SI: It sounds like you are doing a lot more extractions now than you were doing before. SL: Oh yeah. Any other dermatologist usually tries to avoid these things because they're not medically necessary. Usually, we try to tell them not to worry about it, and if it doesn't bother you, just leave it alone. But the blessing with this is that you realize that people don't want to leave it alone—they're actually really happy, they've been searching for someone to get rid of this, even if people tell them don't, and they would love to get it taken care of. SI: What would you say that the future looks like for the Dr. Pimple Popper brand? SL: I created a skin care line called SLMD Skincare, and the first part of the line—this obviously makes sense—is an acne system. And what I'm trying to do is help the general population and the world who, for the most part, can't see a dermatologist. I'm trying to create products that, as a dermatologist, I would recommend to my patients. I'm not trying to be really fancy, or get really expensive with some seed from some remote flower that only grows in some area of the world—this is like the bread and butter. … Educating people to understand it has a lot to do with skin conditions—you really want to exert your own control over it. That really increases their compliance to use the product, and I think it's a sense of accomplishment or exerting a sense of control over your own condition. There are so many things out there that people can use for certain skin conditions that they don't even realize that can be available over the counter. Acne is just the beginning … I'm trying to stress general dermatology. SI: How do you ensure patient privacy? SL: That is something that I take very seriously. For me, the patient always remains at No. 1, they're the highest priority. If they have something really good and they don't want it filmed, I'm not going to film it. We have people sign a consent beforehand. The thing that makes it difficult for me is that it gives me a certain level of responsibility. I'm compelled to check every video before I put them out because it is ultimately my responsibility, or my fault if something went out that the patient didn't want. I think people trust me because so many people have watched my videos before, so they trust that I'm not going to put them in a bad light. "I hope I'm showing [estheticians] techniques—hopefully, I'm teaching them new tips and tricks, and I'm willing to listen and see what kind of ideas they might have for me." SI: What role does esthetics play? SL: Esthetics does play a big role. … There is a definite tie-in. I know I am very closely watched by estheticians in general, and I know a lot of estheticians probably went into what they do because they like blackheads. I hope I'm showing them techniques—hopefully, I'm teaching them new tips and tricks, and maybe sometimes if they have anything for me, I'm willing to listen and see what kind of ideas they might have for me. SI: You mentioned that a lot of people watch your videos because they find them soothing—how would you say that wellness plays a role in what you do? SL: [The videos] make people feel good. I definitely know people watch my videos to help decrease anxiety. People say that sometimes if they feel a panic attack coming, they'll watch my videos and to help soothe them and they help them to fall asleep. People with dermatillomania, who have compulsions to pick their own skin and potentially scar, will tell me that their compulsions have decreased or they don't pick their skin anymore or nearly as much because they watch my videos to satisfy that need. It started off as blackheads, but it has grown into something that a lot of people use for different reasons.